What are your plan’s for today? Plan’s for us are so important. How much would we get done if we didn’t have some form of plan? I was talking with my wife today and one of the many plans we could have laid out was what are we doing for dinner? Ironically, earlier in the day today, I begin to develop some kind of plan for that dinner. The first thing in a good plan is order. If you’re going to barbecue meat, you will need charcoal, lighter fluid to fuel the plan. Next you will need ingredients to bring the plan together; so I drove over to the store and picked up fresh bread, tomato, lettuce, and oh yeah the part of the plan that makes it all so good, the chocolate chip ice cream. The final touches of this plan are of course, what time to cook it, to bring it all together? Unfortunately, not all plans are actually planned before the outcome occurs. I’ve kept a close eye in my prayers for the ongoing trials in Oklahoma, where just last week they were leveled with a massive tornado. Just a week later, when plans were in process for cleanup and recovery, another series of massive tornado’s swept through the same area, taking the lives of 24 more lives along with those lives taken in the first tornado. The difference maker in this round of storm however was different from the one the week before. This series of tornado’s packed hurricane’s wrapped around these massive tornado’s bringing with it massive flooding, and deaths. There will be times when we feel that things can’t get much worse. It appears that just about every step we take the plans that have comes become more intense, with great furor, threatening us to lose hope. It seems to me, the more we plan in our lives, to secure our families from harm, from health related issues, the more I see just how vulnerable we are, and yet not so alone. God is watchful of all the events of the world we live in, He is mindful of all our plans. And yet, for most of us, we see our plans ‘go up in smoke’. Things aren’t turning out the way we planned them. Oh, we prayed over the plans, and for some, waited on God to secure the plans, and yet, we’re left ringing our hands in despair, not seeing the fruit or fulfillment of what we had planned out. The real question to ponder today is, how do I go about defining success for my plans? How can I be sure, that my plans will reflect the will of God for my life, for my family? I found a few answers in God’s Word. 1. Are my plans bringing glory to God for His grace? 2. 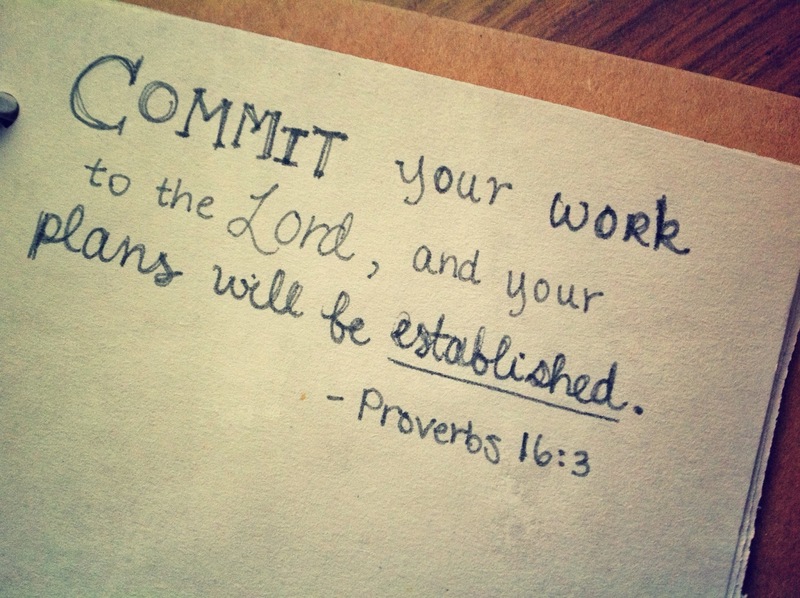 Am I conciously committing, surrendering, my plans to God’s will for me? 3. Am I trusting in my plans that God will be glorified in them? The plans of our lives need to be carefully scrutinized not for the lack of success but upon how God is seen in those plans. Yes, God is even in the plans where our health may be severely challenged. I have to say that as I go through the plans God has presented to Patty and I, that He has a purposed plan, that will bring glory to Him, and with that glory, many others will learn to just accept the plans of God, whether what appears to be good or bad, He always knows what’s best, He holds our eternal future in His hands. What’s not to entrust In His plan, and watch it unfold in His love, mercy, and grace? For I know the plans I have for your says the Lord, plans for good to give you a future and a hope… This post reminded me of the verse of the day on our Wedding day. How this verse and the one you posted in your blog have comforted me through this time. Great Post! What a great reminder to us all, that yes, we should make plans; but it is God who will fulfill what we plan according to what He sees is right for us individually, and will bring us the greater reward. How about you today? Can you say with confidence that your plans are bringing God all the glory, that He may be able touch others lives in a powerful way? Don’t hesitate another moment, give Him your plans and ask Him to perfect them. I hope you enjoy this ‘reblog’ as much as I enjoyed the friendly reminder from God that despite what appear to be difficult or maybe even dire circumstances, God is at work in your plans. Personally, I need to be reminded that He is in my plans as much as I allow Him. Maybe you’ve been waiting for that ‘mountain’ to be moved, and it just appears to be getting bigger. Not allowing God into our plans will eventually leave you discouraged, and discouragement will find you with your head down, not seeing that God has already moved that mountain. I know for me lately, Me and my wife have been experiencing ‘growing pains’ in our spiritual walk with the Lord. It seems that everything we’re praying for in regard to one area seems to be at a standstill. No matter what we do, plan, seems to be making any difference in moving this mountain the Lord has set before us. I was looking at my Walking the Berean Road site this morning, checking on how many, where,from and what people were reading on this site. To my amazement, I noticed this post I wrote last year. As I read it, I found myself being ministered by God through it in a powerful way. The Lord wanted me to be reminded, that His plan is in full effect; He is simply working out details in me and my wife, and in the direction He is leading us to. As I read it, I was prompted by Him to re-post this devotion, adding to it some new thoughts, one year later. I do pray it will be inspiring for you or someone you know as well. Remember, God’s Word says that, ‘Every good and perfect gift comes from above.’. Above…. ..
And so, what about you? What are your plans for today? Thinking about your plans is good, praying for those plans is better; but knowing those plans are going to be blessed by God, is all that really matters! Make your plans matter, bring them to God for a ‘spiritual tune-up’….you’ll find yourself running again; just like new! I found this video, I hope it ministers to you deep, as it did for me. Why not take a moment and let God into your plan, and begin to experience the” peace of God that surpasses all understanding”. Who knows, it may just be the one thing that will lift your drooping head, and you will see the plan God has prepared for you, one ‘exceedingly more, than you could ever ask or think’.